Some thoughts on the season of Lent, prayer, fasting, and Focus40. Many apprentices of Jesus practice Lent every year, beginning on Ash Wednesday (this year, Feb. 22) and ending on Maundy Thursday (this year, April 5). 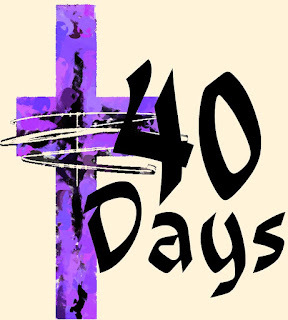 This is to spend 40 days in preparing one's self for the celebration of the Resurrection of Jesus (this year, Easter Sunday is April 8). The Sundays in between aren't counted in the 40 days, as they are "Feast Days" or "mini-Easters," celebrating the victory of Jesus over sin and death. There are sects and individuals who vary on the exact days and times of Lent, so it isn't so much about "doing it right" according to tradition, but "doing it right" according to your heart. For instance, many observe Lent through Easter Sunday instead of Maundy Thursday. Today, my wife Shelly found our 20-month old son, Jericho, getting into my things again. This time was different than the usual (daily), him making random calls with my cell phone, or hiding the TV remote. Today, she found him sitting in my "study spot" at the dining room table, wearing my reading glasses and "reading" my Bible. She snapped this candid pic. It hit me all over again just how much my boys watch what I do. Our kids watch and learn. All the world is their classroom, especially the home. What are we teaching them?